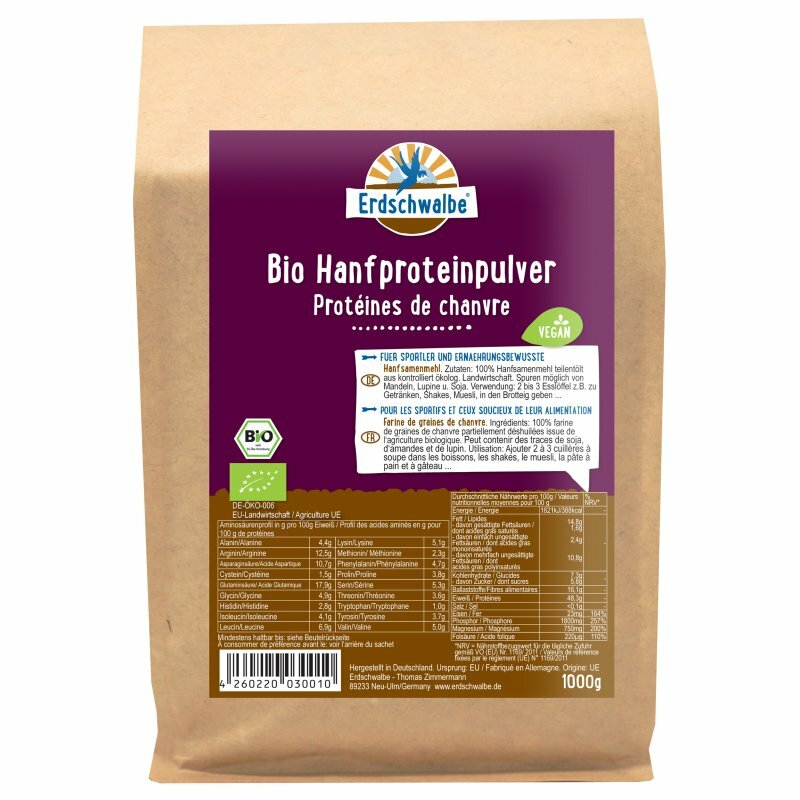 Erdschwalbe EU Organic Hemp Protein Powder - Made and Raw EU - Vegan Protein - 1kg. Ingredients: 100% hemp protein powder from controlled ecological. Agriculture without additives. Features: Up to 50% vegetable, vegan protein with high content of raw materials, zinc, iron, potassium, phosphorus and magnesium. Erdschwalbe organic hemp protein is characterized by its naturally nutty taste and its high mineral and vitamin content. Depending on the harvest, it contains about 50% vegetable protein with all eight essential amino acids and an ideal fatty acid pattern of omega-3, omega-6 and omega-9 fatty acids. Especially athletes have an increased need for proteins, which is why Erdschwalbe Organic hemp protein is particularly suitable for them, but also for vegetarians, vegans and active people. The high content of phosphorus contributes to a normal function of energy production. With fatigue and fatigue, the high levels of iron and magnesium can help normalize energy metabolism. Iron is essential for oxygen transport in the body. Magnesium and potassium are essential for the function of the muscular and nervous systems. In addition, magnesium supports the immune system. Zinc protects our cells from oxidative damage and contributes to the normal metabolism of macronutrients such as fat, proteins and carbohydrates. Erdschwalbe organic hemp protein is characterized by a high content of the amino acid arginine. As a precursor of nitric oxide, arginine regulates the muscles of the blood vessels and their blood flow. Use: 2 to 4 tablespoons, e.g. to drinks, shakes, cereals, cake or bread dough. Store in a cool and dark area.